Chairwoman of National Assembly (NA) Nguyen Thi Kim Ngan paid a visit and offered Tet gifts to the Lung Cu Border Guard Station in the mountainous northern province of Ha Giang on January 27, on the occasion of the upcoming Tet (Lunar New Year). Ms. Nguyen Thi Kim Ngan and Tran Thanh Man, Party Central Committee member and Vice President of the Vietnam Fatherland Front (VFF) Central Committee also attended a national flag salute at Lung Cu flagpole in Lung Cu commune, Dong Van district. 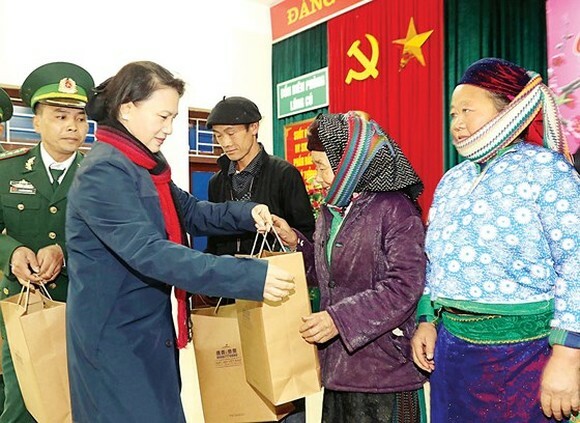 NA Chairwoman Ngan extended her greetings and presented gifts to the officials, soldiers, and residents in Dong Van district. On behalf of Party and State, she highly valued the efforts of officials and soldiers in at the Lung Cu Border Guard Station in building socio-economic development and maintaining political security and social order in the area. The event is part of the program “Spring in border areas” which is held by the Border Guards High Command in coordination with Ha Giang Provincial Party Committee, People’s Council and People's Committee, aiming to care for ethnic minority people, policy beneficiaries and poor households, during the upcoming Tet festival.